What is a sump basin? A sump basin is a hole that is installed in the lowest area of the home that is usually in the basement or crawlspace. It is designed to collect water that has accumulated around the foundation or ground water from underneath the foundation. It is a very important basement waterproofing method for your Hoffman Estates and Chicago, IL home or business because it prevents basement floods and water damage. The sump basin is outfitted with a heavy duty sump pump that is designed to periodically expel water from the basin to ensure it does not overflow. Homes in the Chicago area tend to flood during heavy rains, creating a high water table in the area. Even if you don't live in a high risk flooding zone, you can still be at risk of flooding. Heavy rains could dump so much water around your home over a short period of time, causing the city sewer system to back up and flow into the basement. Also, homes without a slope can allow water to collect at the basement entrance. By hiring a professional waterproofing to install a sump basin in your Chicago home, it will prevent water damage from occurring. Let the experts at United Structural Systems install your sump basin for your home. We have years of waterproofing experience to protect your home from major water damage. How are sump basins installed? Sump basin installation is a quick, easy installation process. Sump basins are drilled into the floor and lined with brick or concrete. 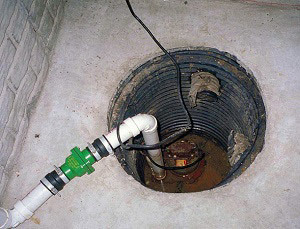 The sump basin connects to a storm drain and the sump pump is equipped with a float that causes the pump to click on during periods of heavy rain. The water is collected and removed outside. The basins starts collecting the water again for the next cycle. In addition to collecting water, the sump basin also collects soil gases, such as radon. Radon is an odorless gas that rises up through the soil and must be evacuated to prevent unhealthy buildup in the living area. Perforated sump basins and sealed lid prevent these gases from being distributed into the living area. They are evacuated along with the collected water. Without sump basin installation, water can flood into your basement and ruin your personal possessions and home's structure. Wet basements can promote mold growth, causing serious health issues to you and your family. If you already have a sump basin and sump pump that is over 10 years old, it may be time to replace it. The experts at United Structural Systems can inspect your sump basin and sump pump system to determine if you need a replacement or repairs. System not turning on: If it is not turning on when it should be, the float switch may be stuck or damaged. A Sump Basin is an important part of the waterproofing system. Along with a sump basin, our experts can install an interior drainage system and an exterior drainage system. Let us handle all of your basement waterproofing needs in the Hoffman Estates and Chicago, IL area. Contact us today for your sump basin installation today. United Structural Systems can install high-quality sump pump basins to prevent water damage and healthy issues for your Chicago and Hoffman Estates, IL home.